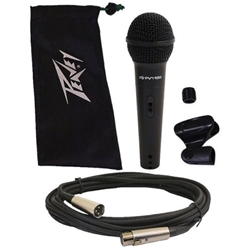 Peavey PVi 100 Dynamic Microphone Pack has everything you need to get started.. The Peavey PVi 100 is a rugged steel construction utilizing a neodymium magnet found in more expensive microphones. The microphone is great for vocals or instruments.